Watch the Title Race live and witness the crowning of the tour's next champions. Gabriel Medina, Filipe Toledo and Julian Wilson. 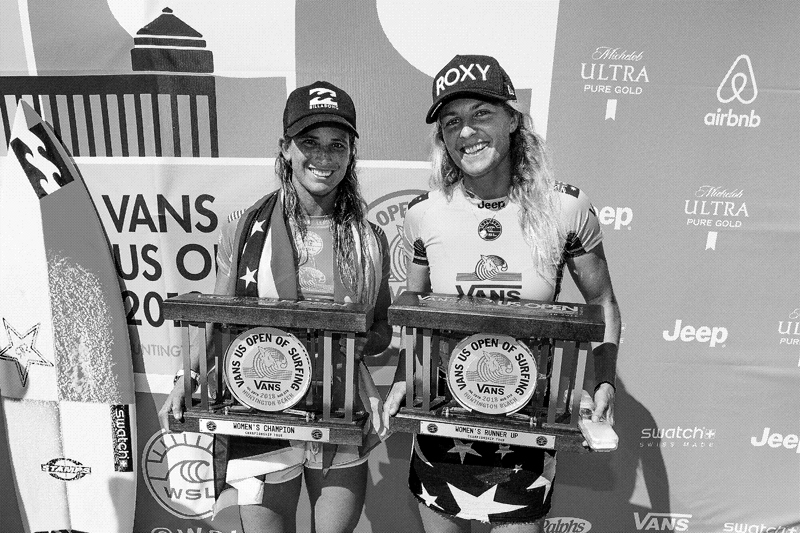 Stephanie Gilmore and Lakey Peterson. They battled rivals and the elements across nine months and five continents to get right here: on the verge of the next Title. Here's how they earned their shot. Wilson came out swinging. He tamed the Gold Coast's gaping barrels and jumped out to an early rankings lead. Would this finally be his year? Peterson hit the Gold Coast hard, setting the tone for 2018 by charging massive Kirra barrels. She's chasing her first Title -- and winning the first event had that dream burning bright. Italo Ferreira stole the show with his first-ever CT win, Julian dropped at 13th but held onto the Jeep Leader's Jersey, and Medina finished 3rd -- would the 2014 World Champ be in the hunt again? Gilmore punched back at Bells, setting up a searing rivalry between the two that would dominate the conversation, and results, for the rest of the year. Gilmore wins again. Two in a row from a six-time World Champ? Is she making a run at seven? Peterson evens the score by winning her second event of the year in Bali. Four events in it was Gilmore - 2, Peterson 2 -- would it be a head-to-head Title Race in 2018? Wilson charged into the Final for a 2nd place finish, while Medina and Toledo banked solid 5ths. Gilmore chipped away at Peterson's lead, but they both fell short in the contest. Toledo didn't just win, he dominated, surfing with explosiveness, power, and more speed than anyone is used to seeing on a surfboard. And the win got him the #1 spot and the Jeep Leader's Jersey. The women hit South Africa and Gilmore demolished J-Bay en route to a big win over -- you guessed it -- Lakey Peterson. Would that Final become a preview of the Title Showdown? Where's Medina? There's Medina. He's on the Tahiti podium again after a dramatic win, and poised to make the kind of late-season Title push he's become famous for. 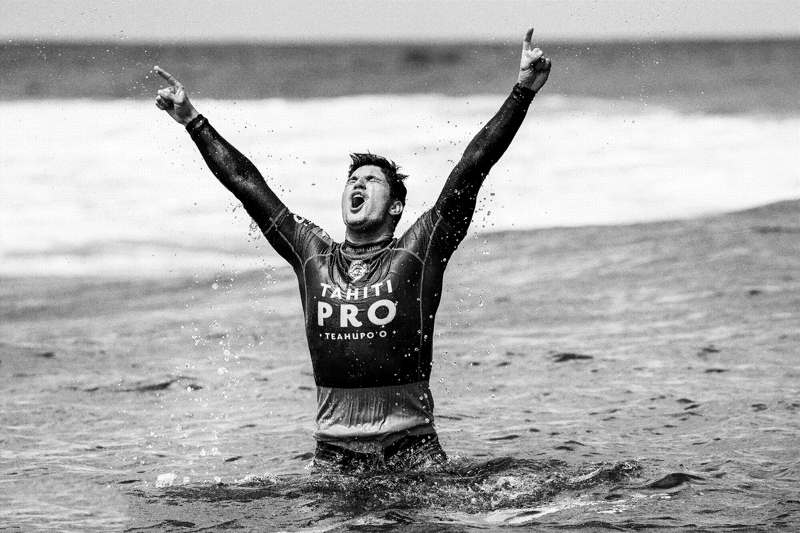 Toledo booked his best-ever finish at Tahiti, a 3rd, good enough to keep the #1 spot going into Surf Ranch. Gilmore charged into the Final at Huntington Beach and put big-time pressure on Peterson -- there are only three events left, and Gilmore is running away with it. Medina makes it two wins in a row, beating out a high-flying Toledo, and moved within striking distance of the #1 spot in the rankings. Gilmore and Peterson were 2nd and 3rd which meant that the race was still on, but with a win in France Gilmore could clinch the Title. Wilson came out of nowhere to win the event and re-enter the Title Race! And maybe most importantly, he did it by beating Medina in the semi's. As for Toledo, he dropped out in the third round and, for the first time since J-Bay, handed over the Jeep Leader’s Jersey to Medina. Gilmore lost! Peterson missed an opportunity to gain ground and went down in the very next heat. With both contenders out in round three, it became fact: the 2018 World Title would be decided between Gilmore and Peterson at Hawaii's hallowed Honolua Bay. Medina had the Trophy in his sights. An event win here clinches the Title but Medina lost to Italo in an electric semifinal and the table was set: Medina vs. Toledo vs. Wilson at the Billabong Pipe Masters for the 2018 World Title.